Food is an essential human need, particularly after a disaster when demands for physical activity can increase caloric requirements. While the human body can survive without food for some time (even weeks if hydration is maintained), the average person needs 2000 - 2400 calories per day to maintain caloric balance, and more if they are engaged in strenuous activity. Why is food in short supply after a disaster? After a disaster, shortages in food may occur for several reasons, resulting in the need for emergency food supplies. The loss of electrical power will result in the eventual spoilage of refrigerated and frozen food. Once electrical power is lost, food in the refrigerator is safe for up to four hours. Food in a freezer that is normally kept at 00 Fahrenheit can last from 24 hours (for a freezer that is half-full) up to 48 hours (for a freezer that is completely full). A full freezer has more thermal mass resulting in longer temperature retention, so keeping containers of frozen water or gel packs in a freezer that is only half-full can help to extend storage time up to 48 hours. Road closures may prevent you from getting to the grocery store. Even if you are able to get to a local grocery store, road closures throughout the region can affect commercial food distribution. Because most grocery stores rely on daily shipments to maintain inventory, once the supply chain is interrupted, inventory will be limited to what is on hand. Additionally, any loss of power will interrupt financial transactions and shut down cash registers and all credit/debit card transactions. Having cash on hand will help to enable purchases for the limited stores that try to remain open. Building damage to stores and shops can render their food supply inaccessible and result in their closure. Additionally, structural damage at home can also render food destroyed or inaccessible. Keeping emergency food in more than one location at home can help to ensure the accessibility of your food supply. To prepare for most disasters, start by keeping at minimum a three-day supply of emergency food that doesn’t require refrigeration, cooking, or a lot of water to prepare. Most emergency managers recommend storing seven days of food, based on actual experiences with natural disasters throughout the United States. And some disasters—such as a pandemic—may result in a need for a longer supply of food, so it can be beneficial to store more than seven days of food, if you are able to do so. The Department of Homeland Security recommends that households store emergency food that family members are familiar with and will readily eat, take into account special dietary needs, and avoid foods that make you thirsty (e.g., high sodium content, very dry foods). Familiarity. Trying out a new food item for the first time might not be the best idea after a disaster. You might discover that the new food item upsets your stomach. Or there could be a family member that normally likes peas, but discovers that they really don’t like the freeze-dried peas from the disaster food supply. Including food options that you normally eat can provide psychological and physiological benefits. Nutritional value. Your disaster menu should include meals that provide for sufficient calories per meal and per day. Budget around 2000 calories/day for women and around 2400 calories/day for men. If strenuous activity is anticipated, the number of calories should be increased by about 200 calories. While foods high in fat and high in sugar quickly add to the calorie count (e.g., junk food! ), they provide limited nutritional value. And it is just as important to ensure that food has enough fiber for proper digestion. Ease of preparation. The conditions that would cause you to use your emergency food supply will also make it a challenge to prepare food. Loss of electricity, natural gas, or water will prevent normal cooking. 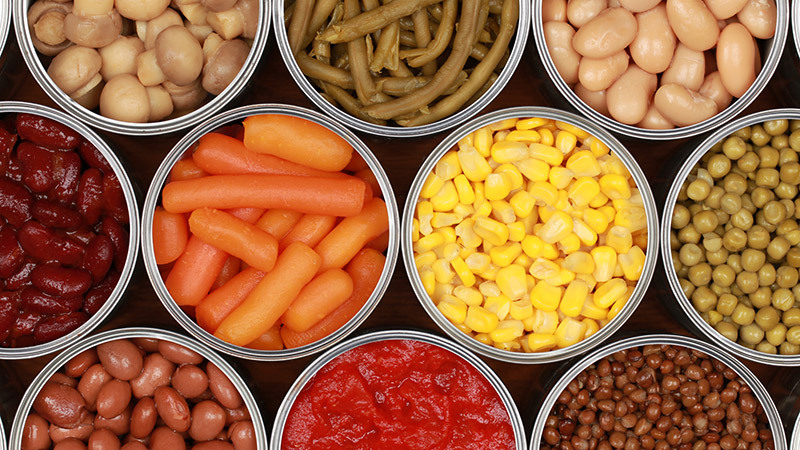 Consider commercially canned foods that are ready to eat and don’t require heating, such as meats, fruits, and vegetables. Just remember to pack a can opener with your disaster food supplies! Shelf-life. The shelf-life of your disaster food supply can be viewed in two different ways: “best if used by” (length of time food retains its original taste and nutrition) and “life sustaining” (length of time food preserves life and remains edible). Carbohydrates, proteins, and fats all age in different ways. While carbohydrates won’t change much over time, proteins can deteriorate and fats can become rancid. Most food items can be safely eaten past the “best if used by” or “use by” date. For example, a sealed box of cereal is typically safe for 6-8 months after the “best if used by” date. Canned food items are typically good for two to five years (high acidity foods such as tomato sauce has a shorter shelf life, low acidity foods will last longer). Most freeze-dried food has a safe shelf life of up to 25 years or more. Always check food before eating; discard food that smells rancid or cans that are bulging or dented (but remember that tasting food is not an effective way of determining if food is safe!). Finally, storage conditions such as temperature, moisture, oxygen, and light affect shelf life, even for canned and freeze-dried food items. Keep it cool, dry, and dark! Specialty Items. Emergency food bars are a popular item online and at many disaster supply stores because of their long shelf life and stability. While they are advertised as providing a three day food supply, they only budget 1200 calories per day. Also, these should be taste-tested well before a disaster to ensure that you can tolerate it as a food source. Emergency food bars can play an important role in your emergency food supply (e.g., a few packs kept in the car), but should not be considered a primary or only resource for emergency food. Upsizing your food inventory. Adding extra food to your usual inventory, especially canned food items, can be an effective way of building your emergency food supply while minimizing waste and excess cost. Buy an extra can or two every time you restock that particular item and you will soon have a small disaster supply. Set a number for key disaster items so there is always a minimum in inventory, and be sure to rotate the stock, so your disaster supply isn’t always at the back of the pantry where it expires before being used. Setting aside an emergency food supply. Setting aside a dedicated emergency food supply ensures that you don’t accidentally use it as part of your normal food supply. Keeping it in a separate location can help make it accessible if the area where your normal food supply is damaged. Storing your food supply in a cool (room-temperature), dry, and dark place will ensure the best shelf life. Freeze-dried food has a higher up-front cost, but the extended shelf life can provide long-term savings. Hot water is used to prepare freeze-dried food; room temperature water also works but will take longer to reconstitute. Keep extra water on hand for food preparation if you are using freeze-dried food in your disaster plan. Storing your emergency food supply. Keeping your inventory in a cool, dry, and dark location is essential to maximizing the shelf-life of your emergency food supply. Storing your emergency food supply in crates or bags will also help to protect those items from physical damage. Food items, especially canned food, can get quite heavy, so smaller crates or bags can make moving your emergency food easier to handle, as well as easier to pack into a trunk of a car, in case you need to evacuate or relocate to another location. Loma Linda University Health does not endorse any specific website or vendor. However, the following websites are provided for additional information and as examples of best practices and local/online vendors for emergency food supplies.